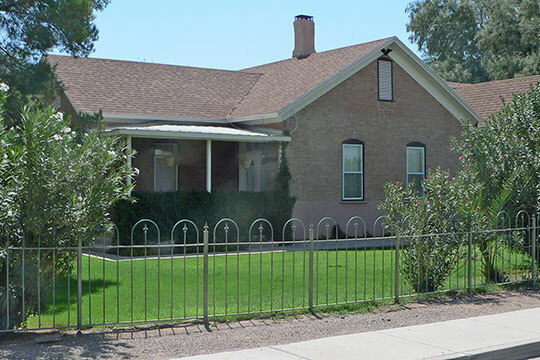 Florence Town Hall is located at 775 North Main Street, Florence, AZ 85132; phone: 520-868-7558. Photo: Albert Colton and H. H. Freeman House, ca. 1889, corner of Butte Avenue and Willow Street, Florence, AZ. Listed on the National Register of Historic Places in 1986. Photographed by User:Ammodramus (own work), 2013, [cc-by-1.0 (creativecommons.org/publicdomain/zero/1.0/deed.en)], via Wikimedia Commons, accessed November, 2013. The Town of Florence was part of the post-Civil War boom in Arizona. It was established in 1866 and soon became an important political center as well as a supply and shipping center for nearby mines and agriculture. The first courthouse was an adobe building which soon after completion was unable to handle the rush of business. Traditionally, the main economic was the state prison, built in 1909, and the town's position as county seat. Marjorie H. Wilson, Arizona State Parks Board, Second Pinal County Courthouse, Florence, AZ, nomination document, 1977, National Park Service, National Register of Historic Places, Washington, D.C.